When I became an actor in the 50s all actors were posh and if you spoke Brum, like me, you did your best to disguise it. Not just because the whole business had its nose in the air, don’t you know, but because nearly all the roles were of posh people.The typical West End play, produced by Binkie Beaumont, featured a jolly chap sauntering through French windows, casually swinging a racket, saying, “ Whose for tennis?”. There might have been a couple of lines for a Cockney char lady in Act two. The BBC was like a cross between a finishing school and a St James’s gentlemen’s club. But by the 60s, riding an increasing wave of social change, my generation decided to do something about it. Under Sydney Newman, a Canadian vulgarian who didn’t have a clue about our class system, drama with another perspective swept through TV, first at ABC on Armchair Theatre, then under him at BBCTV, with Granada and even Lew Grade’s ATV following behind. It became an irresistible surge. With my colleagues I created the National Theatre of the Air, in which people who were not Etonian were heard, from their point of view, in their dignity. Dockers from Liverpool, coal miners from Durham, homeless mothers from London. We were told there wouldn’t be an audience, that people didn’t want their drab lives dramatised, they wanted “to be taken out of themselves” into a nicer world full of glamorous people. The audience responded in huge numbers, because audience appeal is about responding to credible characters and compelling story telling. What the BBC and the also – rans offer now is either sub Hollywood attempts at internationalism, chasing the dollar, or the repetitive riffs of cops and crime. That does not add up to a platform for a national conversation. Because individual lives are culturally specific and most people are not cops or murderers. To blame the actors is pointless and unfair. Gerald du Maurier with his cigarette holder would have been a bit player in the 60s; Albert Finney wouldn’t have got arrested in the 30s West End. It’s the subject matter of the drama, stupid. I’ve known some total tossers who went to Eton – and Winchester and Harrow and so on. Some, like Bloody Boris and half the Cabinet I don’t want to know. But so did George Orwell. So did Jeremy Sandford, the sweetest man, who cared enough about the fate of a neighbour to research and write Cathy Come Home. Showbiz reflects society. We’ve now regressed not to the 50s, but to the 30s, in life chances, despite all the new Universities and student debt. It’s difficult to be convincing outside your social class, although that never stopped posh actors plummily telling me they were going to “play down, you know, a sort of rough North Country”. Society is on the turn once more. There is a burning resentment in the air. Because of its reach, TV is the key to action. So put pressure on the BBC and others, demanding that the people’s voice be heard. Just being caricatured in the soaps is adding insult to ongoing injury. Demand that commissions are offered, and followed through into production, of dramas that take working people’s lives seriously, from their point of view. People played by actors from similar environments. Change the content of the writing and you redress the balance. Fighting that old patronising world in the 60s and 70s I naively believed we’d made a permanent shift. Well, now our films from those decades look isolated. My apologies. The revenge of the toffs has been relentless. It’s time to fight. We pushed them back once. Now you have to do it again. Just don’t let them tell you it’s not possible. The country is awash with gifted writers and talented actors, credible because they’re authentic. It’s just that producers have not been encouraged to find them and love good work out of them. They need to be given a chance. And if they don’t take it, sack ‘em and find new ones. It’s depressing to flick through over 100 channels of dross, especially when so many great films and docs don’t get to the small screen. Walter Presents on C4 is a rare exception to the dumbed down TV rule showing international quality dramas. But you would have to go a loving way to find some of the quality of Keys or Law and Order on TV today. They were just so sharply observed and critical that something as good as that today would be difficult to imagine. Meanwhile ithe BBC remains far too dominated by southern, privately educated and out of touch individuals. 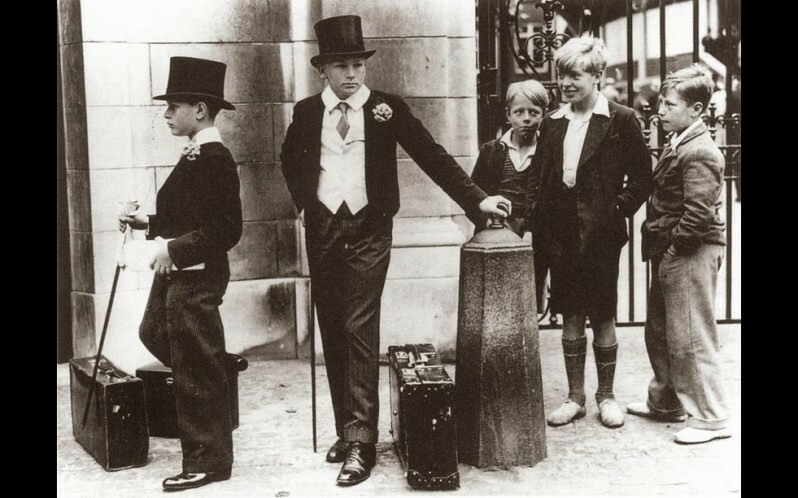 You need another picture – this one is famously of HARROW boys and doesn’t depict Etonians at all! You’re quite right. The boys on the left of the picture were from Harrow. if you’d gone on to read my blog, you would have seen that I am explicit, mentioning other schools like Eton – even Harrow. But thank you for pointing it out. The title of the image was wrong.